While the official arrival of spring may still be a few weeks away, we are more than ready for sunshine, flowers, and lovely spring décor! When it comes to planning events throughout the spring, the use of fresh blooms, bright colors, and sweet treats are affordable ways to create beautiful atmospheres—and can be excellent DIY projects! 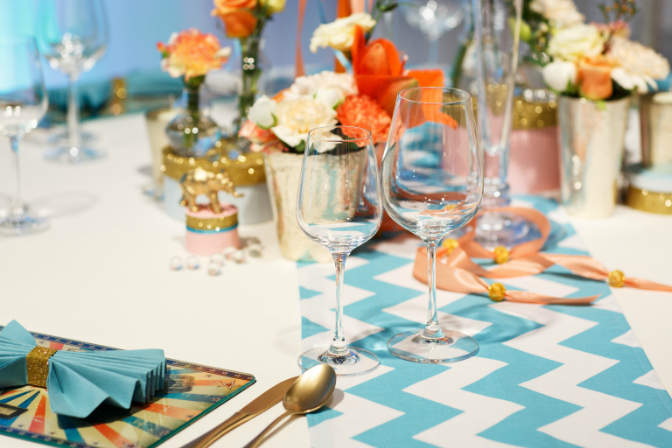 As you help your clients plan ahead for their events and weddings this spring, we’ve got you covered with some DIY spring event décor ideas that will delight and brighten every event. Plus, they’ll suit all of your budget-friendly clients! Lilac Bunches: When it comes to fragrant spring flowers, lilacs are one of the most beloved and budget-friendly! Tie a bushel of lavender lilacs with a cream-colored ribbon and place one on each chair (or church pew) that lines the aisle. Flower Crown: Not only does your bridal client have many different flowers to choose from during the spring months, a flower crown is a versatile accessory that works with nearly any hairstyle and style of bride! Roses and orchids are great choices, and all your client needs is florist wire, scissors, tape, and this helpful tutorial by Lauren Conrad! Flowery Arch: Arches are one of the most romantic elements of décor when it comes to wedding ceremonies, especially when they’re filled with lush spring flowers! 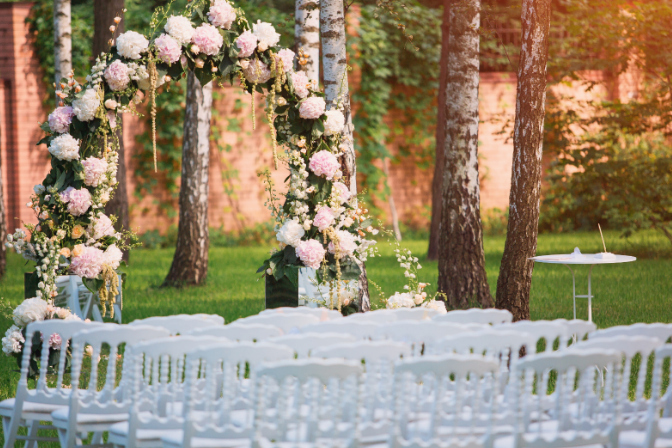 A metal arch will cost your client $85.00, and then the creative process can begin—daisies, sunflowers, roses, and other greenery are beautiful choices to fill a wedding arch that will serve as a budget-friendly backdrop for spring nuptials. 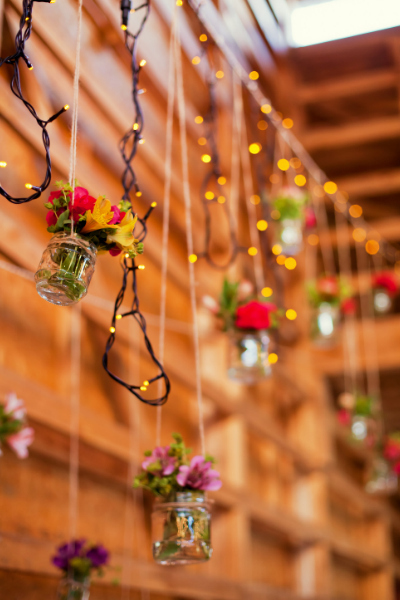 Mason Jars and Twinkle Lights: Romance is the name of the game with this DIY idea, as tiny mason jars filled with water and delicate flowers are hung from strings along with lovely twinkle lights. This décor is very easy to employ—find out how! Wedding Card Lantern: Heartfelt wishes from wedding guests are always welcomed by the happy couple. But if they’re written down on cards, they can be kept forever! Turn a lantern into a congratulatory card collection box by placing it in a main area and writing instructions next to it for guests—not only do lanterns evoke memories of spring and summer evenings, they are also inexpensive (or free, as your client may already own one)! chirping is a sure fire sign that spring has arrived. Channel this cheery feeling with some paper place cards in the shape of birds. Using colors that match your client’s wedding theme, cut out bird shapes from thick stock paper (we recommend 3.5” x 2.5”) and print or write each guest’s name —add a small slit at the bottom and turn the paper bird into a perched accessory for a wine or champagne glass! Back in December, QC Event School tutor and owner of Greatest Expectations, Heather Vickery, predicted that 2017 would be the year that patterned linen hit mainstream events, and spring is truly the time for patterns to shine! If your client has a generic table runner, it can be given a DIY spring makeover with some colorful acrylic paint, stencils, and a paint roller. Flower Runner: Why limit the use of fresh flowers to wedding ceremonies when they can be used beautifully to adorn tables? Daisies, orchids, lilies and roses are just some suggestions to make to your client. You can secure them to sturdy netting and build on the volume until they’re happy with the size. The runner can be laid on a table, and will look more natural flowing over the sides. Colorful Candy: Fun favors never go out of style, especially of the brightly colored and sugary variety! Next to each place setting at a wedding or other event, a small jar full of colorful jellybeans can be dressed up with a pretty ribbon for a lovely effect (and treat!) for guests. Lemon Bowl: Lemons are one of the most attractive and freshest fruits available, so fill a vintage bowl with lemons as a table centerpiece. This is both a colorful and inexpensive way to add some zest (no pun intended) to your table décor! Spring is a time of renewal and new beginnings, so use these ideas as inspiration for new DIY projects! Head to your local craft store and get creative! Don’t forget about the centerpieces—read on for our guide to centerpieces for your next spring event! Really very informative on DIY spring decor for the budget event planner. Thanks for sharing it. LOVED the idea with the mason jars and twinkle lights!